Just last week, Disney teased that they would be doing an all new show for Disney Springs. The weird buzzing indicated that it would do something that had never been done before, and would utilize unmanned drones to perform a show in the sky above Disney Springs. Late Sunday night, that show became a reality as the new, yet to be named, show began testing over Disney Springs. The folks over at Attractions Magazine happened to catch that test, and it was nothing short of spectacular. The new show uses drones, preprogrammed to take shape with the help of bright LED lights. While this was not the full show, which is said to list about 15 minutes, the test is a great indication of things to come. 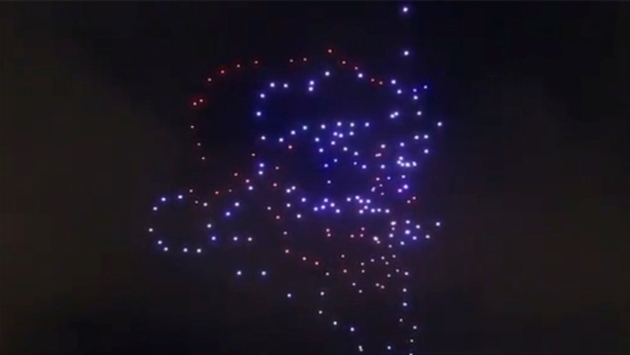 Using festive Christmas music as a background, the show transforms hundreds of drones into a dazzling light show that transforms within seconds. The lights form many traditional Christmas shapes, such as candy canes, nutcrackers, angels and of course, the jolly old elf himself, Santa Claus. Surprisingly the whine of the drone engines can scarcely be heard over the super festive music. That was a main concern for many, as drones tend to produce a high pitch buzz similar to mosquitoes. The transition between scenes is nearly flawless, making for a nonstop show. The lights are also surprisingly bright in person, though the video doesn't do it much justice. The drones also do well at mimicking bursts from fireworks, though it's still a good way from being mistaken for the real thing. The use of drones were approved by the FAA just a few short weeks ago, which makes this new show very surprising. There is no word on an official start date for the show, though Thanksgiving weekend looks like a good time to start planning on seeing it. Over 60 different stores will offer Black Friday deals at Disney Springs, which should make it a great time to showcase the new show. With the testing of this first show a success, it's likely we could see more shows pop up around onsite hotels within the next few months, especially if the crowds at Disney Springs react positively to it. With the show being relatively low cost to run and maintain, it's likely Disney will use the drones in many more applications in the not-too-distant future. As for Disney Springs, the drone show is one of many new attractions at the shopping area this holiday season. The drones join magical Christmas Trees, live performers and of course, Santa Claus. The best part is that the Christmas festivities come free of charge, with no admission fee. It also means that the Disney Springs area will be extremely busy this holiday season.